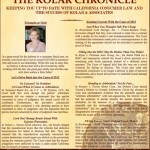 We are pleased to introduce to you “The Kolar Chronicle,” a monthly update for the legal community involved in automobile transactions and other consumer law. The Kolar Chronicle will serve to keep you up to date with the most recent California court decisions and important defense verdicts or rulings that our firm has won for our clients. We hope that you find this newsletter useful and informative. We will continue to help our clients fight the good fight both in and out of the courtroom.